Discmania Mini Target allows you to build a mini disc golf course just about anywhere! 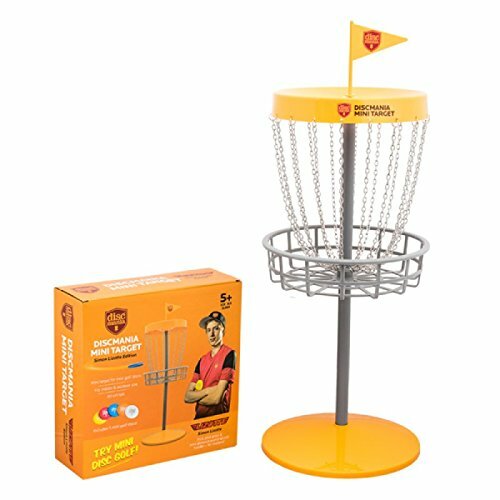 Get one for your office and another for the backyard The box contains the mini target and 5 mini discs - just add your creativity and you'll always be ready for a round of mini disc golf! Perfect for backyards and slow days at the office! The basket height is 31 and 1/2 inces. Assembly only takes a couple of minutes with the instructions provided in the box! Discmania Mini Basket is endorsed by Team Discmania's trick shot master Simon Lizotte . Film your trick shots and post them to Instagram with the hashtag #DMminiTarget. The Mini Target is suitable to ages 5 and up. Suitable to ages 5 and up.